No. 203, Jalan Pasir Puteh, 31650 Ipoh, Perak, Malaysia. Longlife Weld Sdn. Bhd., the sole distributor of WIM products is a major marketing force in WiMs' group in Malaysia. 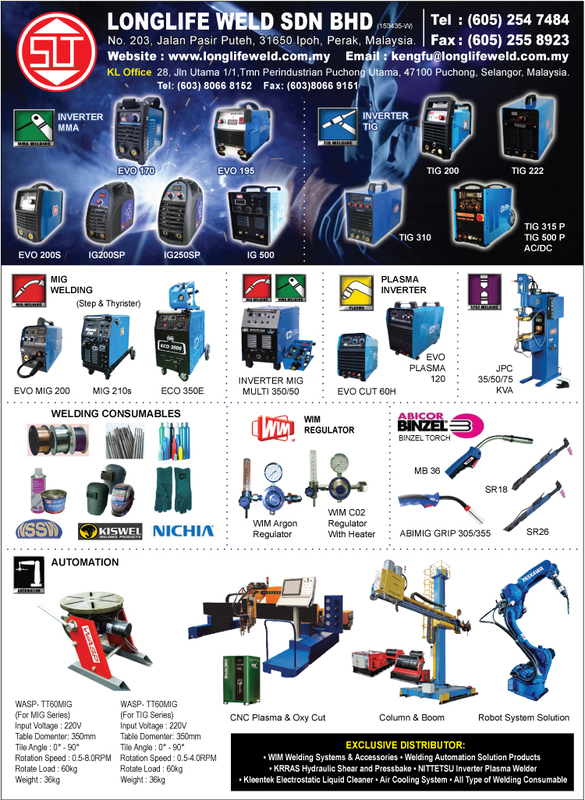 Established in 1979, LongLife has earned a reputation for effective, reliable and professional marketing of comprehensive range of welding products with the main aim of ensuring a greater concentration in the marketing, servicing and distribution of WIM products. Recognizing the need to fulfill our customers' requirement throughout the world, our team are well trained coupled with its efficient distribution network to provide excellent before and after sales service to customers' need effectively and professionaly is our motto. LongLife Weld Sdn. Bhd. will continue to enhance the tradition of providing excellent customer service and to reinforced its distinction for effectiveness and efficiency with professionalism in all its dealings. WIM's commitment to quality is further enchant with incorporation of Yaskawa Electric Corporation (Japan). These innovative technology enable WIM to provide robotic automation "Motoman" to our customers. All these contribute towards WIM's efficient services for our valued customers with lass risk and greater certainty.